Featuring Avi Z. Kestenbaum and published in The Wall Street Journal Feb. 3, 2014. A family member can fall down on the job for any number of reasons. Maybe he’s an entitled heir who constantly misses deadlines. Maybe she’s a sibling who works half-days because she would rather be an artist. Or maybe he just isn’t up to snuff—like any other bad hire a company might end up with. But if the situation is handled badly, it cannot only hurt the business, it can also tear the family apart. If owners wait too long to address the problem, it can build resentment that can’t be easily soothed. And if they treat the family member badly during the separation, it can burn bridges that can’t be mended. “Remember: When all is said and done, you need to be able to sit at the Thanksgiving table together,” says Raymond Lucas, senior vice president of financial planning and training for Integrated Financial Partners. 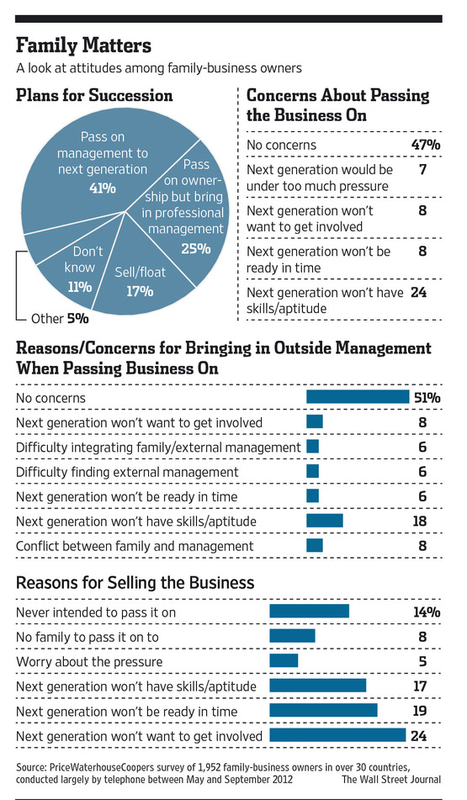 With that in mind, here’s some advice from family-business pros about the best way to handle the problem. First, the experts say, owners should make repeated attempts to help the family member improve their performance. But after it’s clear things aren’t going to work out, deal with the problem quickly. “The longer it lingers, the worse it gets,” says Joseph Heider, regional managing principal at Rehmann Financial. Owners should also be sure that all family members in the business agree about removing the problem employee. A lack of a united front will cause turbulence, says Karol Ward, a New York psychotherapist. “If someone wants the removal but also feels emotionally guilty, their conflicted opinion may derail the intention of the other family members,” Ms. Ward says. When it’s time to make the move, another family member—ideally the problem employee’s boss—should set up a time to speak privately to discuss the separation. “Screaming at each other in front of other employees creates a hostile work environment,” says Keven Prather, a MassMutual adviser in Cleveland. During the conversation, owners should let the family member know they want him or her to be happy at work and that they realize that’s not the case, says Joseph Astrachan, executive director of the Cox Family Enterprise Center at Kennesaw State University. They should reinforce that person is a valued member of the family and address him or her from a position of “caring and love,” he says. More practically, it’s also crucial for the family to document why the person is being terminated so the family is clear that it’s a business decision, not one based solely on emotions, says Ms. Ward. And while the family doesn’t have to change its decision, they should hear out the family member’s protests and listen to what he or she has to say, says Mr. Astrachan. As for the exact details of the separation, experts generally advise being generous. Owners could offer that the family member be paid leave to investigate other careers, says Mr. Astrachan. They might also pay for a career counselor or psychologist to develop a plan for what to do next. If the family member’s new plan involves starting a business, the owners might offer to invest. If the relative is a shareholder, the situation becomes much more complicated. Unless the company has a buyout provision, the family can’t legally take away someone’s ownership interests, says Avi Kestenbaum, a partner at Meltzer, Lippe, Goldstein & Breitstone. If the family member has voting control, not much can be done to have them leave, says Donald DiCarlo, managing director at Wilmington Trust. Of course, withholding distributions could be problematic for all owners, not just the unwanted one. What’s more, it runs the risk of causing a family rift and should be used as a last resort. “The goal is to keep the business running profitability, not to make any enemy within your family,” says Edward Kohlhepp, a financial planner in Doylestown, Pa.